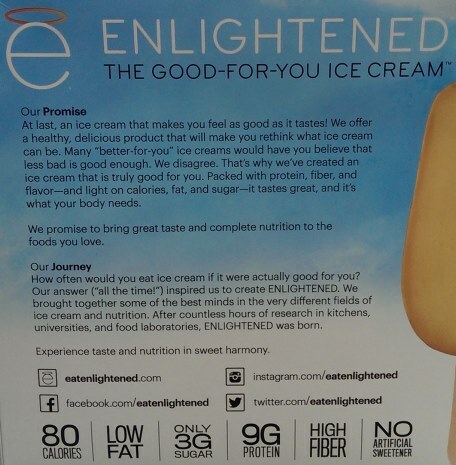 [New for 2014] I got an email a few weeks ago asking if I would like to try ENLIGHTENED, "the good-for-you ice cream". I had contemplated buying these as they started popping up at Shaws and Whole Foods, but I just wasn't sure which flavor I should try first. Their current line up is made up for 5 bars and two sandwiches. All the treats are low cal, low fat, low sugar, high fiber, and with no artificial sweetener. Yes, all that and it's still technically ice cream. ENLIGHTENED did ask if I could try their new Peanut Butter flavor first if I was able to, and well, I was able to. Here we go! I take a bite... and maybe I need to let it tempter for a few more minutes. Uggg, I'm not even sure it's fair to review this sample. The outer 1/4" is one consistency and the inside is distinctly another... unless that is just the way it's tempering.... Hold on, let me try eating this another way (like a pudding pop rather than biting it). Ahhh, yeah, that's better, but, well, now I wish these were more of the shape of a classic pudding pop rather this larger form factor. Yeah, I really don't know what to make of this treat, but that's not necessarily a bad thing. I tend to be pretty cranky so you guys know I would toss this if it was really bad. Instead, I'm intrigued and press on. Regular peanut butter has that naturally fiber-like texture to it, so it's a good match up for a bar like this. It's not a super strong flavor, it's more like a mild peanut butter cream rather than straight peanut butter. It's definitely not a run of the mill flavor. On Second Scoop: Ok, I took a quick bite before tempering to check the texture and indeed the bar's texture is now uniform. While the inside had one texture yesterday, that same texture is now the whole bar, so I guess we are waiting. I was trying to overlook it yesterday, but the thing that is bugging me most is the sugar replacement in these things. While many people don't even notice it, I tend to be overly sensitive to replacement sugar, whether it be real or artificial. The way it hits your tastebuds just isn't the same and it can be hard for me to overlook. The overall flavor isn't bad, I actually find the peanut butter cream flavoring rather novel, but I'm still trying to settle in to the overall vibe of this bar. Verdict? Ok, I need feedback here. I'm not positive if I got an off box or not. Let me know if you've tried these, what you think of them, and which flavor I should try next. Thanks! I had one that didn't go through a million temperature cycles! I like the texture and creaminess of the bar, but I wish the peanut butter flavor was more present. I'm a huge PB addict! 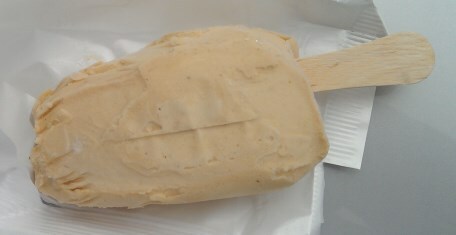 I just tried Yasso's Vanilla Bean Greek Frozen Yogurt Bar. They also carry a peanut butter cup flavor, which I think you should review for us and then compare it to this! 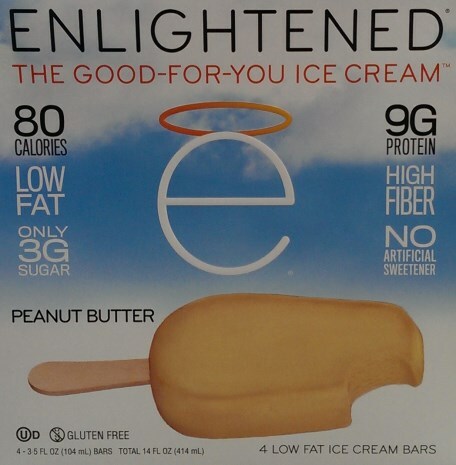 Peanut butter ice cream is my favorite food, so this Enlightened bar sounds pretty amazing! I really like Enlightened but they do take a while to temper. Definitely try the Mint sandwiches next, but throw them in the microwave if you dont want to wait. @Stride: I'm not sure I've seen the PB flavor, but I'll look! Just had a coffee one tonight. Definitely mild on the coffee flavor but I didn't mind. Much easier to locate than Halo Top! If you enjoy ice cream, eat it on occasion. If you'd prefer suffering through a healthy alternative, the Enlightened Ice Cream is for you. This product, in my opinion, tastes nothing like ice cream. I am a doctor, an athlete and a health enthusiast, but I'd prefer enjoying my Carvel. I stumbled on these at my local Winn-Dixie on sale. I eat very healthy and the benefits on the box had me interested. It almost seemed to good to be true so I knew they would be terrible (or so I thought) and figured for the price no big deal if I did not like them. Well now I am addicted to them. Once you get through the outer portion of the bar the inside is rich and creamy. It takes a long time to finish one. It seems very indulgent to me and in no way feels like I am eating something with only 80 calories. I can't wait to try the other flavors. I saw it on sale for $2.50 and decided to try the Peanut Butter. It doesn't taste much like ice cream to me but it was still tasty and I luv the low calorie and 3 sugar. I will definitely buy them again. I've been depriving myself of ice cream because of the calories and sugar. THANKS Enlightened. I tried the chocolate. It's not ice cream, but to take care of my occasional chocolate/ice cream cravings, while trying to eat healthy, it works quite well. My texture and consistency were good and the bar looked nothing like the one above. I like it a lot and don't feel even a little guilty indulging @ 70 calories with 3 grams of sugar, 2 grams of fat, 8 grams of protein, and 5 grams of fiber, non GMO ingredients. If I am someplace and want to truly indulge in an ice cream treat I do, but to have in my freezer for any old day, I love these. @ Last Anon: ummm, that's the chocolate peanut butter swirl bar, this is the plain peanut butter bar, glad you enjoyed it though. Found these at my local Publix the other day. The nutrition info caught my eye. I thought they sounded like they'd be terrible, but I am happy to say they are very good. They are exactly like an ice cream bar, except they aren't quite as sweet. Got used to the less-than-normal sweetness in about 1 minute and I am thoroughly happy with them. I can't wait to try other flavors. I purchased the Fudge bars. They take about 1-2 min to soften enough to eat. For the record, mine looked a lot better than your photo (not crinkled or anything). They are glorious. Who gives a shot of its not a good shape?! When you want a treat that has no chemicals and won't blow your diet and tastes great... Go ahead and have one of these. @Euro: newsflash: things rarely look like the picture on the box. ok, crankiness aside, I'm glad you enjoyed it, but this site is about setting realistic expectations about when you open a box and unwrap something. I don't cherry pick my shots. I grab a box like every other consumer and hope for the best. Had the other three bars in the box looked better, sure, I would have taken a new photo, but all four looked the same.